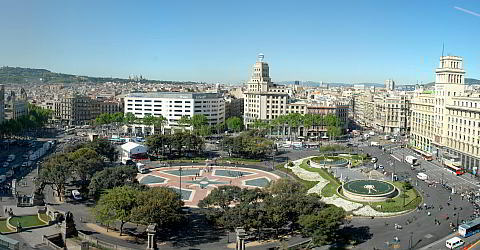 The central location of the Plaça Catalunya, you can not avoid coming to this central transport hub of Barcelona. The space is as an interface between the Eixample district and the city and has at least approximately 50,000 m² being as large as St. Peter's Square in Rome. The site is located at the northern end of the Rambla. It is the focal point of many roads: pedestrians, metro stations, bus stops and road crossings. Here also keep in contact with the AeroBus, which runs directly to the airport and the double-decker tourist buses. Very nice is the fountain at the northern side and the benches which invite a brief rest. Anyone who might be able to buy at one of the stalls feeds and thus attracts thousands of pigeons. The place is not very beautiful. The place has been rebuilt so often that there is no specificity to stress. On the eastern side of the square, opposite the department store El Cortes Inglés, the tourist info can be found in the basement, where you can pick up the Barcelona Card. Our tip: On the top floor of the department store El Corte Inglés on the eastern side of the Plaça de Catalunya, you will find a cafe with a glazed viewing terrace. The view from up there should not be missed. El Cortes Inglés is Spain's largest department chain. Here you will find many regional products, such as suitable souvenirs. Since the Plaça Catalunya was a starting point of some of our tours, we recommend the café for breakfast.